2017 is a good year for rewards cards. Whether you want cash back, airline miles, or hotel points, there are some great deals out there. 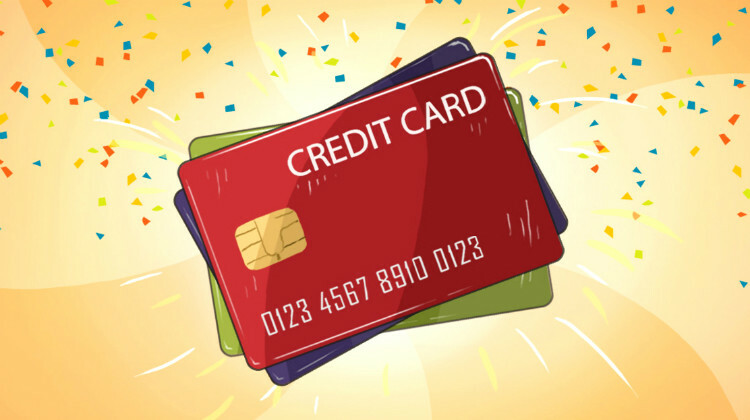 We did the research for you and found the best rewards credit cards. If you want your everyday purchases and any big purchases you plan to make to be a little less expensive, these are the best cards for you. Sign Up Offer: You’ll get $150 in bonus cash after spending $500 in the first 3 months. Percentage: You get an unlimited 1.5% back. Categories: There are none! You get the 1.5% back on all purchases. Fees: There is no annual fee. For the first 15 months, the APR is 0%. After that, the APR varies from 14.24-23.24.
Credit Score: You’ll need an “Excellent” rating for this card, a score above 750. Sign Up Offer: You’ll get $100 in online cash rewards bonus after spending $500 in the first 90 days. Percentage: You get 3%, 2%, and 1% cash back. Categories: The 3% is for gas, the 2% is for groceries. That is limited to $1,500 for gas and groceries combined each quarter. The 1% is for all other purchases. Fees: There is no annual fee. The APR varies from 13.24-23.24%. Credit Score: You’ll need a score of “Excellent” or “Good” for this card, a score above 700. Sign Up Offer: You’ll get $100 in cash reward bonuses after spending $500 in the first 90 days. Percentage: You get 1.5% cash back. You will also get a 5% cash rewards redemption bonus to use toward your next redemption. Categories: There are none! You get and unlimited 1.5% back on all purchases. Credit Score: You need a score of “Excellent” for this card, a score above 750. Having a good airline rewards card can have all sorts of benefits. Flying can be an ordeal these days; these cards can help take some of the sting out of it. Sign Up Offer: You’ll get 25,000 bonus points after spending $1,000 in the first three months. Earning Points: You get 2 points for every $1 spent with Southwest Airlines and their hotel and car rental partners. You get 1 point per $1 spent on all other purchases. On the anniversary of your membership each year, you will automatically receive 6,000 bonus points! Partners: Some of the hotel partners include Best Western, Hyatt, La Quinta, and Marriott. Some of the rental car partners include Alamo, Avis, Hertz, and Thrifty. Perks: With the cost of baggage fees, this is a great perk! First and second checked bags fly free! This card also comes with no blackout dates. If there is a seat available, you can book it with your points. Fees: This card comes with an annual fee of $99. There is no foreign transaction fee making this a good card to travel internationally with. The APR is 16.24-23.24%. Credit Score: You need an “Excellent” score for this card, a score above 750. Sign Up Offer: You will receive 25,000 bonus miles once you’re approved for the card and it will take 2-3 weeks for them to hit your account. This is one of the few rewards cards that doesn’t have a minimum spend before applying your bonus! Earning Points: You earn 3 miles per $1 spent with Alaska Airlines and 1 point per $1 on all other purchases. Partners: Alaska has dozens of worldwide partners including Delta, American Airlines, and British Airways to whom you can transfer points. Perks: Alaska has some great ones! You get a free checked bag for yourself and up to six travel companions booked under your reservation. You also get one Coach Companion Fare each year which discounts a travel partners ticket to just $121 with fees and taxes. Fees: The card comes with an annual fee of $75. There is a foreign exchange fee of 3%. The APR is 15.49-19.49.
Credit Score: You need an ‘Excellent” score for this card, a score above 750. Sign Up Offer: You will receive 30,000 bonus miles after spending $1,000 in the first three months. You will also receive a $50 statement credit when you make a Delta purchase within those same three months. Earning Points: You earn 3 miles per $1 spent with Delta. You can also accrue miles when you make a purchase from one of Delta’s partners as well but are subject to that partner’s earning schedule. Partners: Delta has several partners including Air France, KLM, and Alitalia. Perks: Delta gives card holders one free checked bag and Priority Boarding. While it’s getting easier and easier to find inexpensive flights, inexpensive hotels are a bit harder to come by. A good hotel credit card can help pay for a big chunk of your traveling expenses. Sign Up Offer: This is a good one! You will receive 80,000 points after spending $3,000 in the first three months. You will receive another 7,500 points after adding an authorized user who makes a purchase in the first three months. Earning Points: You earn 5 points per $1 spent at Marriott properties, 2 points per $1 when you buy airline tickets directly from Marriott’s airline partners (so not through a third party site like Expedia or Hotwire), and car rentals and restaurants. You will earn 1 point per $1 spent on everything else. Partners: Marriott partners with several airlines including American, Delta, JetBlue, and United. Perks: You earn one free night at a Marriott Category 1-5 property each year on the anniversary of your membership. Fees: The card has an annual fee of $85. There is no foreign exchange fee. The APR is 16.24-23.24%. Credit Score: You need a score of “Excellent” to qualify for this card, a score above 750. Sign Up Offer: This is another good one! Many of us don’t get a lot of vacation time so we try to stretch it out by doing some of our travelling on weekends. But hotels are generally more expensive on weekends. That’s what makes this sign up offer so good. You will receive a certificate for two weekend night stays after spending $2,500 in the first four months. Earning Points: This is another category where this card really shines. You will get 10 points per $1 spent at Hilton Hotels, 5 points for airline purchases and car rentals made with Hilton’s partners, and 3 points for all other purchases. Partners: Hilton has partnered with several airlines and car rental companies including American, Delta, United, Alamo, Avis, and Budget. Perks: You will have Gold Status with Hilton for as long as you have this card. Gold Status comes with perks like free use of hotel fitness centers and free internet. Sign Up Offer: This is another good one! You get 50,000 points after making your first purchase. You’ll get an additional 35,000 points after spending $2,500 in the first 90 days. That’s enough for nine free nights at a Category 1 property! Earning Points: You get 10 points for every $1 spent at Carlson Hotels and 5 points per $1 spent on all other eligible purchases. Partners: Carlton has partnered with several airlines including Air Canada, American, Delta, and United. Perks: Once you’re approved for the card, you will be granted automatic Gold Elite Status. This status gives you a 15% discount on food and drinks in participating hotel restaurants, complimentary room upgrades, and a bonus 40,000 points for each year you continue to carry the card. Fees: There is an annual fee of $75. There is a 3% foreign transaction fee. The APR is 14.24-23.24%. So Which Card is Best? That depends on what type of rewards you will use most. We know that thoughts of free air travel and hotel stays can be tempting but consider if you really travel enough to make paying the annual fee some travel cards have to make it worthwhile. If you’re not a big traveler, a good cash back card would suit you better. The Chase Freedom Unlimited is nice if you don’t want to keep track of categories and because it has a good sign up bonus of $150. If you fly a lot, those baggage fees can really take a bite out of your wallet. The Alaska Airlines card not only gives you a free checked bag but up to six people travelling under your reservation but you can also get one of those companion’s a cheap flight once a year with Alaska’s Companion Fare. If you are lucky enough to live near a major airline hub and pack light enough to only need a carry on (what is your secret?! ), flights might not be the most expensive part of your travel, so that leaves hotels to eat up your budget. The Citi Hilton sign up bonus of two free weekend nights is hard to beat. If you choose the right credit card, your everyday life and your vacations can be considerably less expensive!